The Gift mark Round Cherry Stained Table and 2 Matching Upholstered Chair Sets, with Solid Wood Backs. The Table is Made of Solid Wood. These Durable Table and Upholstered Chairs will add a touch of sophistication to any child's room or Play Room. Intended specifically for your Child. Children Play for Hours on end. 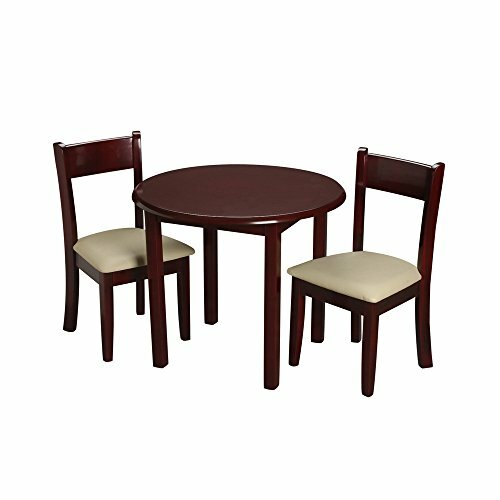 Our Solid Wood Table and Chair Sets clean easily with any High Quality Furniture Polish. All Materials are BPA Free and Phthalate Free. All tools are Included for easy assembly.